I'm sure every book reviewer has that moment when they wonder, "Am I a bad person if I don't like this?" For me, that book is A Long Walk to Water. 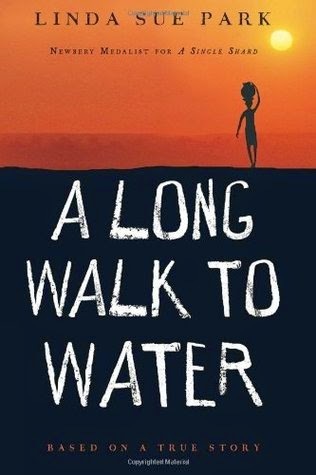 As I was procrastinating writing this review, I saw a tweet that said, "A Long Walk to Water is so good! It sparked a thoughtful discussion about if reading helps us become better people :-) #titletalk" Oops. I really wanted to love it. There were many Sudanese "Lost Boys" that worked at the Trader Joe's near where I grew up. I had a vague idea of why they were in Massachusetts and always marveled at them, so tall and friendly. I was eager to read a story that I could share with my students, but I just didn't get it from Linda Sue Park's short novel. I wanted more in-depth information, especially since it is based on the true story of Salva Dut. Perhaps it is because the book is targeted at children, but I wanted to know about Salva's time in a refugee camp. Since he spent six years there, it merited more than one sentence. While I admit that the book picked up at the end, for me, most of the book was similar to Salva's journey across Sudan: a grueling slog. I won't be recommending it.